On a recent trip to Tallinn I was surprised by the lack of cultural information for tourists. As European capital of culture 2011, Tallinn had managed to raise it’s profile as a city break destination with major Newspapers such as the Telegraph and the Guardian posting really positive reviews. When Ryanair announced a new route Dublin > Tallinn I decided to jump on the Tallinn/ Capital of Culture bandwagon. I have been watching the Derry~Londonderry City of Culture 2013 project develop and I was intrigued to see what such a title could bring to a city. I think it’s fair to say that my trip to Tallinn was a healthy mix of work and play. Before I went I checked out the Capital of Culture website which was nothing more than a 2D listings site. When I arrived in Tallinn I was surprised by the lack of information available. I expected cultural ambassadors and prominent tourist information but after 5 days the only info. point that I came across was in the docks, far out of the city. I can only presume that this was intended for people getting off the Helsinki > Tallinn ferry. Holding the title Capital of Culture is such a great opportunity and it seems a shame that Tallinn isn’t making the most of it, especially as Estonia has the reputation of digital innovative country. Estonia was one of the first countries in the world to include access to the internet in it’s bill of Human Rights, it is home to Skype, and it prides itself on its free Wi Fi coverage so why then is the Capital of Culture campaign so old school? Why is their website so flat? I should point out that despite the lack of tourist information I had a brilliant time in Tallinn, it’s a really friendly city, the food and wine are both good and cheap. 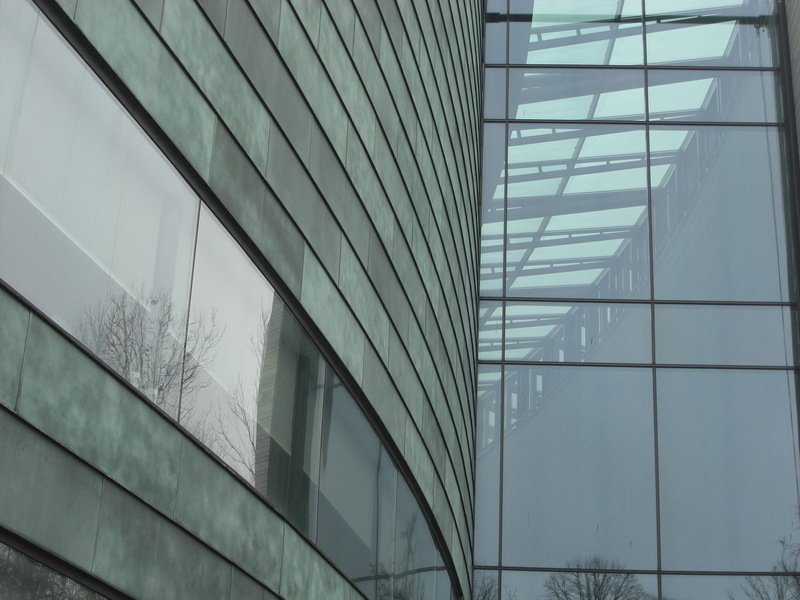 My cultural highlight and the jewel in Tallin’s cultural crown has to be the outstanding Kumu museum. Opened in 2006, it was awarded the title European Museum of the Year in 2008. I was really impressed by such welcoming language and this was reflected when I visited the museum (which by the way I would recommend dedicating a whole day to!) The museum is about a 20 minute walk out of the old wall town, through some pretty grim communist era housing, but is surrounded by a beautiful park. The contemporary architecture is refreshing as Tallinn is a mix of medieval and communist architecture. The exhibitions on display ranged from Estonian Art, to a Print Triennial. The museum was full of helpful and friendly staff, they even had colour information leaflets on each of the artists in the Print Triennial, a no doubt expensive luxury that most museums could only dream off! 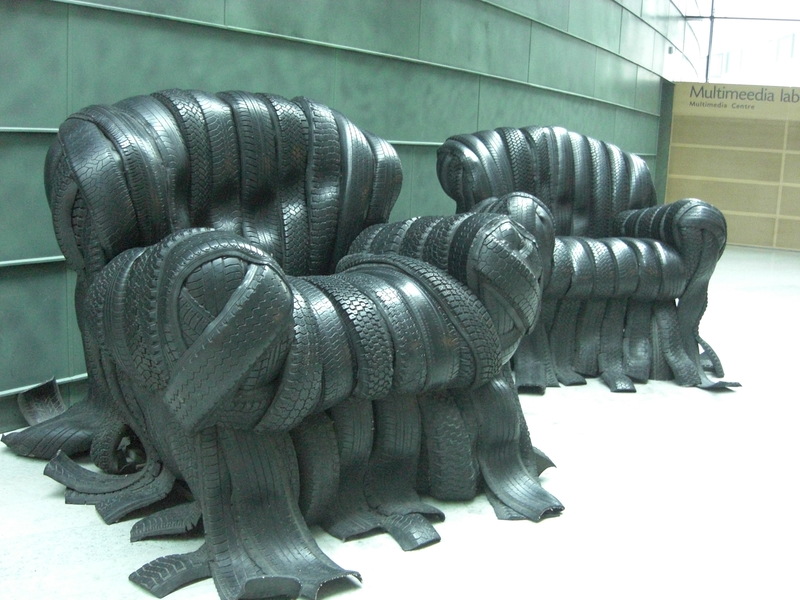 As we were leaving we decided to ask something we had been thinking about since we arrived, ‘can we sit on the chairs?’ The chairs being giant chairs made from used car tyres by the artist Villu Jannisoo. The Answer? yes, but then we should have expected that by now, the Kumu is a fun, welcoming and engaging museum that would not look out of place in any major museum capital from London to New York. It’s always inspiring to see such innovative approaches to museum practice in stand alone locations, I wonder if the museums of Derry~Londonderry will shine so brightly when they get their big moment during Derry’s stint as City of Culture 2013? I’m just catching up on your post on Tallinn now Oonagh. Like you I’ve found little on the Estonian websites and it is surprising. Your post encourages me to go to Kumu when we are there – I do like the idea of the highlights. Art was never really intended to be seen in bulk I feel. I prefer popping in and focussing on a few exhibits rather than trying to do it all. This is what I do in London although of course there is the luxury of going back. I suspect though that the cultural highlight of our visit to Estonia is likely to be the side trip to St Petersburg. I did love Tallinn, just as you say found the lack of information strange. We spent 5 days there but I think you could do it in a couple. Although I hear it is stunning in the summer as Estonia has lots of forests and little Islands. St Petersburg is on my wish list so I’m excited to hear what you think of it when you get back.